5th Evolution: New Genres for Your 5E Game! 5th Evolution (5Evo) takes the wildly popular 5E game mechanics and applies them to new genres: super heroes, WW2, and 80s horror. 797 backers pledged $25,589 to help bring this project to life. 5th Evolution (5Evo) takes the wildly popular 5e game mechanics and applies them to new genres. 5Evo products are a marriage of comics and roleplaying. Learn more about 5Evo with this explainer comic! 5th Evolution is intended for gamers who enjoy the 5E game engine and would like to use it in other genres. 5E is wildly popular, has been extensively play-tested, and is easy for new players to learn. Many players familiar with 5E are hesitant to learn a new system, and 5Evo allows them to explore new worlds and genres of play seamlessly. What does this Kickstarter Contain? World War II - Set in North Africa in 1942, you'll crew an M5A1 Stuart tank on a special mission during Operation Torch. This book contains the adversaries, equipment, characters, and vehicles to run a WW2 North Africa campaign with or without supernatural elements. Super Heroes - Set in Carbide City in the present day, you are part of a team of the super heroes trying to stop a gang of super villains wreaking havoc downtown. This book contains the super villains, equipment, and player archetypes to run a supers campaign. 80s Horror Films - Set in the small town of Woodhaven in 1985, you and your friends get in over your heads and uncover a dark plot while seeking a party. This book contains the monsters, equipment, and teen hero archetypes needed to run a horror campaign set in the 1980s. 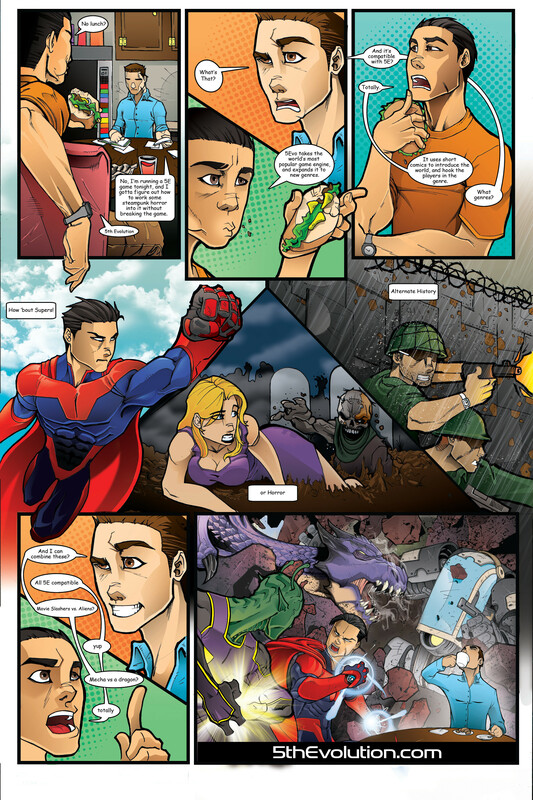 Download "No Going Back", our free sample comic and adventure PDF. 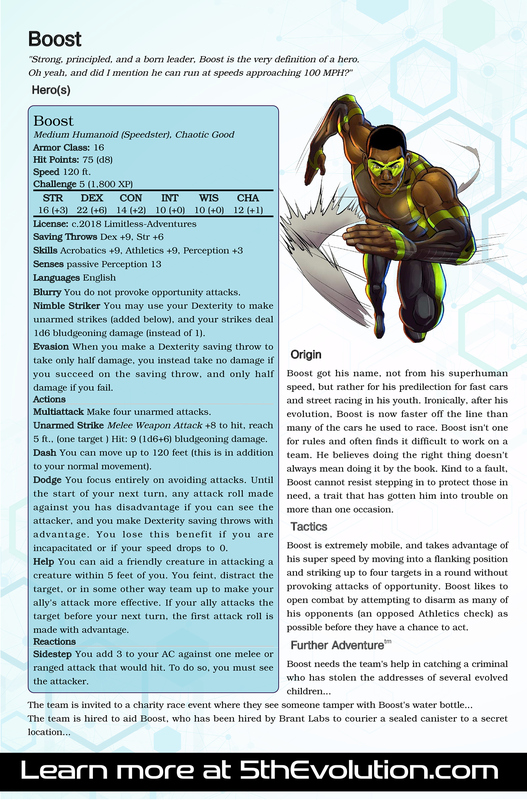 Meet "Boost" - A 5Evo NPC! Note: This is not a stand alone game, these books still require DnD5e core books or rules from the SRD. We recommend 5thSRD.org. $15,000 - STL files for you to print your own M5A1 tank and ammo tokens! At $15,000 we will unlock .STL files you can use to print your own M5A1 "Betty" Stuart tank to use with our WW2 sidequest. Also included is the .STL files to print the four shells used by the M5A1, so your loader/commander and gunner can keep track during combat. We'll also unlock an online store where everyone can purchase discounted M5A1/ammo 3D prints for those without printers. Includes 3D printable 3" removable base for the tank. Turret can be rotated, and can have magnets installed to hold it in position. Shells have space in the base for tungsten weights to keep them upright on the table. We'll reveal more details about the Carbide City setting and further stretch goals as we unlock each level. Every Kickstarter has risks, but for this project they are minimal. This is our fifth Kickstarter. We have delivered every project on time and without incident because we write the material in advance. We have delivered four projects successfully and this be no different. You will receive a PDF copy of all three 5Evo books: WW2, Supers, and 80's Horror. You will receive a PDF copy of all three 5Evo books (WW2, Supers, & Horror), as well as a softcover print version of each book. •	Note: Reduced shipping outside the US for Archenemy level backers.